I’ve been a green juice lover for a very long time, but up until this past spring, I had never made my own juice! 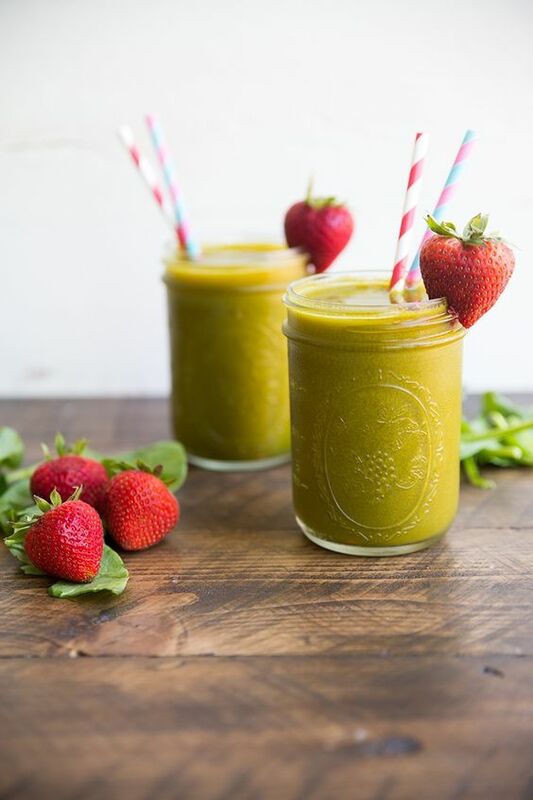 Although “juice” isn’t often considered paleo, I have always known that certain types of juice can be extremely nourishing to the body and can work just fine within a paleo diet. I would even go so far as to say in the right context, they could also be worked into a Whole30. The reason juice gets a such bad rap, especially in the paleo community, is because it can often be void of nutrients and overflowing with sugar. There are three major things you want to look for when selecting a juice. Sugar Content. First of all, you want to make sure your juice isn’t going to be a sugar bomb. 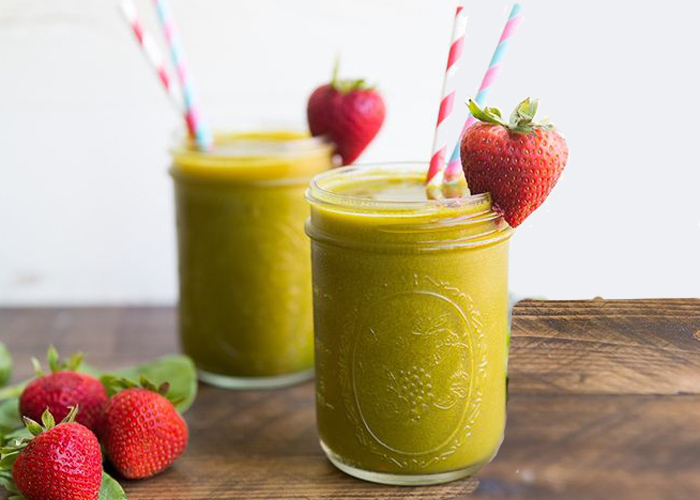 Juice with only fruit is normally the culprit here, but a good amount of green juices or juices that “seem” healthy often contain hidden fruit like apples, pineapples, etc. that can increase the sugar content. Personally, I like to stay below about 20g of sugar per 16oz or even lower if I am really trying to limit my sugar intake. Quality of Ingredients. We all know that greens like kale, spinach and lettuce plus fruits like strawberries and apples are on the dirty dozen list. Just because you juice a non-organic fruit or veggie, doesn’t mean you are getting rid of the pesticides. Not only that, but many juicers allow you to juice entire fruits like lemons and oranges, with the peel. Although those fruits may be considered safe to eat because of their thick rind, when you juice, you’re getting everything. So something that may not be that bad to eat non-organic, could very well be not so great for juicing. Preferably, you want to find or make a juice that contains 100% organic ingredients. Pasteurization. How the juice is processed after it’s made is also extremely important. A juice could contain a limited amount of sugar, high quality ingredients, but then be pasteurized with heat thereby eliminating all of the nutrients the juice once had. Why? The vast majority of juices (and countless other beverages) are pasteurized using heat, which boils the juice to such a high temperature that it ends up killing all of the nutrients naturally found in the fruits and veggies. Thankfully, many companies are now starting to use a process called HPP, where items are pasteurized using pressure instead of heat, where the nutrients stay intact. Other than juices processed with HPP, obviously raw juice is also a fantastic choice. You won’t be able to find raw juice in the grocery store (unless you can order a fresh one), because they go bad within a number of days. However, there might be a local juice shop near you that sells raw juice, or, you could make your own! As I mentioned, up until this past spring, I had never made my own juice. I worked at Suja Juice for 2 years, so it wasn’t that I didn’t want to make my own juice, I just didn’t have any reason to! After finding out that green juice was amazing for people struggling with digestive issues or people needing to detox (I needed to in order to heal my hormonal acne), I decided I was long overdo for juicer of my own. 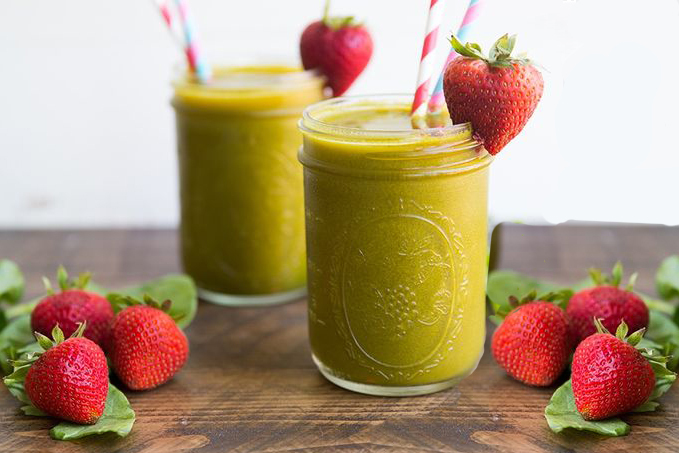 Buying juice at the store can be extremely expensive and if you’re like me and want the freedom to have fresh juice as many days a week as you want, investing in a juicer is a great choice. Not only can you totally control the ingredients that you buy, but you’ll also save time and money. Unlike what you may have heard, juicing at home is NOT HARD. Don’t let people convince you that it will take you hours and hours to make juice. It’s just a flat out lie. If you buy the right juicer, you will not only be able to avoid a vast majority of the prep, but you won’t have to cut anything at all. If you could just buy a bunch of produce without peeling and chopping it and put it right into your juicer, wouldn’t you be sold?! Of course you do want to make sure you’re getting the proper juicer. I currently have the Breville Juice Fountain Plus. It is a perfect juicer for someone that hasn’t juiced at home before and as far as juicers go, it’s relatively inexpensive, clocking in at just under $150. Most high-quality store-bought juices are around the $10 mark, so you can think about it this way… it pays for itself in just 15 juices. The best part about my juicer is that the feeding chute is so large that you often don’t have to chop any produce before feeding it into the machine. Some large apples or oranges I have to slice once, but otherwise, everything goes right in. Not only that, but the cleanup process is a breeze. Simply dump all of the pulp, rinse and you’re done! Several of the pieces in the Juice Fountain Plus are dishwasher safe as well to make the cleanup even easier. If you follow me on Snapchat, you know that I make juice all the time without a recipe. Everything has always turned out wonderfully and delicious every time. Having said that, a lot of you asked for a juice recipe, so here it is! This is a juice I’ve been making over the past few weeks that I absolutely love. You won’t often find strawberries in juice but let me tell you, they are an amazing low sugar and antioxidant-rich addition! Add all ingredients to the juicer one after the other, making sure to alternate between fibrous veggie and non-fibrous. Ie, follow your kale with the cucumber, apple or celery to ensure that you are getting the most juice out of each ingredient. This recipe may make a bit more than the 32oz the juicer's container allows for. If you have a different or larger juicer, great, if not, be sure to pour out the contents of the container halfway through so that it doesn't overflow. Pour juice into a 32oz mason jar and store in the fridge for 2-3 days. I like to use these plastic lids as they are much easier to deal with and won't rust like the metal lids. « Is Your Sunscreen More Dangerous than a Sunburn? this green juice looks wonderful. 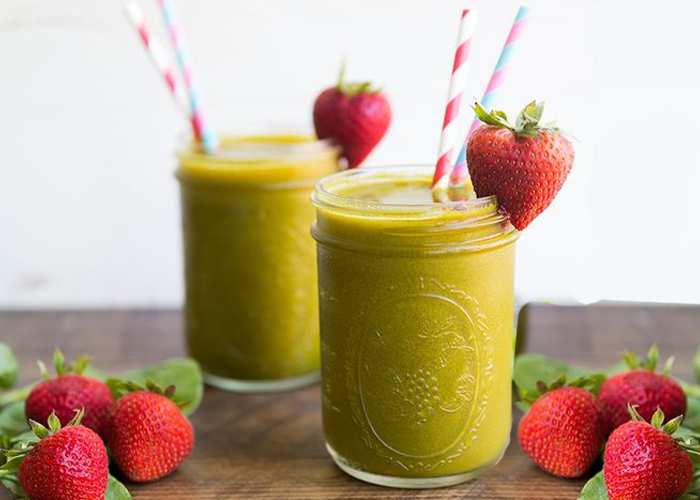 i often make green juices but rarely change them up – next time i’ll definitely be adding in strawberries and numeric! thanks! Let me know what you think! I always try and mix things up when I juice, makes it so exciting and I’ve never been disappointed!